Please join us for the benefit dinner and release party of First Person #5: Radical Foods! Legendary filmmaker Les Blank will be screening his 1980 film Garlic Is As Good As Ten Mothers. I’m totally going. I’ve never seen that movie, which I hear is great, and the menu sounds really awesome, involving artichokes, sardines, Tartine bread, chicory salad, mashed up potato/sunchokes, and other vegetal delights. If you want to go to the event, buy tickets here; a bargain at $40. The only problem is garlic has so disgusted me during my pregnancy that I banned the allium from our kitchen and “forgot” to order bulbs when I made my fall seed order. Maybe the baby is a vampire. Now, here it is, garlic planting season, and I found myself with no bulbs to plant (9 months from now, odds are I will be back on the garlic train). Lucky for me, my dear friend Leilani had a stash in her bedroom. I went over to her house last night to eat dinner and see the Halloween Trick or Treaters in her neighborhood. Instead of candy, she gave me garlic. This garlic is pretty special, too: her dad is an agronomist in Oregon, and he has made some special crosses to make entire new breeds. One of them, which Leilani calls the Fire Twin, comes as a bulb with only two cloves. But the cloves are large, the size of a shallot. And they are incredibly spicy hot. 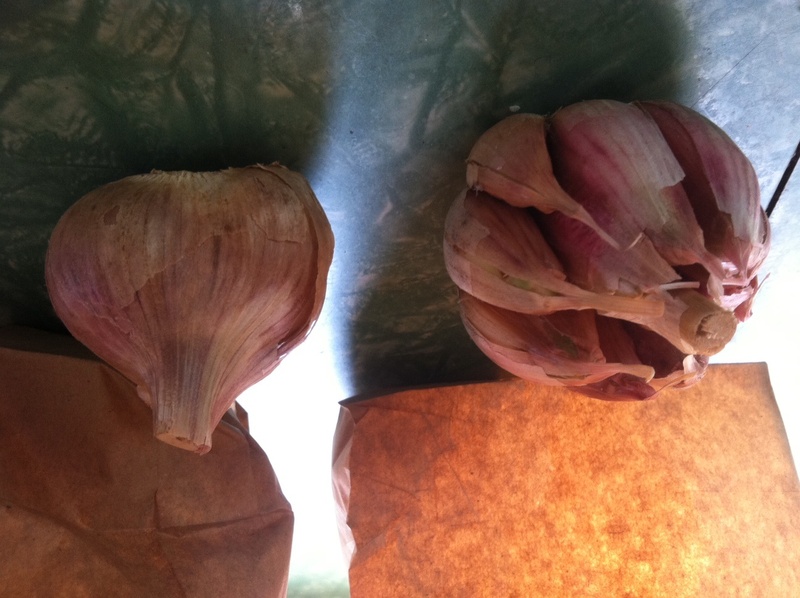 Saving garlic from the Fire Twin will be a little frustrating–one for me, one for next year’s crop–but if it tastes good, it might be worth it. The other ones I selected are pink, purple, and big bulbed white. I’ll do a taste test next summer, with details about the crosses. This entry was posted in field trips, vegetables and tagged first person magazine, garlic, les blank. Bookmark the permalink. When I was pregnant, I couldn’t stand onions or garlic. They were like my kryptonite. I swear I could smell them over a block away when they were being delivered to the bodegas in my neighborhood. And god forbid a neighbor would actually cook them. On several occasions I actually screamed out the window pleading for them to stop. Pregnancy is weird. just wanted to say that I’ve just read your book Farm City. Loved your story and your book. Congratulations on the baby news, your life is about to change dramatically. Enjoy! woah! i need some of that garlic. does your friend have any more? i can pay for it, or trade them some detroit honey or something else. This is my first year growing my own garlic. I planted Music. I bought 1lb, so I’m interested in how much I’ll have to eat vs. replant. I’ll probably replant most of it so I can build up a bigger stock. I’m really looking forward to grilled scapes though. YUM. Thanks! What a great website! I have lived on what we call a lifestyle block for 11 years, and now my homeschooled children are grown, I am enjoying growing food, keeping chickens and bees, and in general, being the ‘hippy’ I was too scared to be in my youth – I’m 60. I love reading about urban farms because I fear that one day we will have to move back to the city, and I’ll be wanting to garden and keep chickens and bees there too. Ditto what Cally said except that I’m in Georgia and my homeschooled children are still children. I’m in my 40’s and the hippie in me is slowly emerging. Bees and chickens are in my future. So glad I found you! “Ghost Town Farm” blogger and “Farm City: The Education of an Urban Farmer” author Novella Carpenter is a UC Berkeley grad and yes, urban farmer in Oakland. She made headlines this spring after the city of Oakland told her she needed permits in order to sell the produce she grows on her farm. She continues to blog about her urban farming project, but has faced a series of fines. She’s an invaluable resource for other urban farmers and those looking to start. Congrats. I dunno if you;ll be eating garlic, though. Some people find their babies hate the taste in breast milk. lol. Plant one and let it go to seed. That way you’ll get more than if you plant the cloves. Just a thought.